Shuna is a wanderer, shamaness and teacher whose mission is to promote understanding between humans and all other living creatures, including the elves. 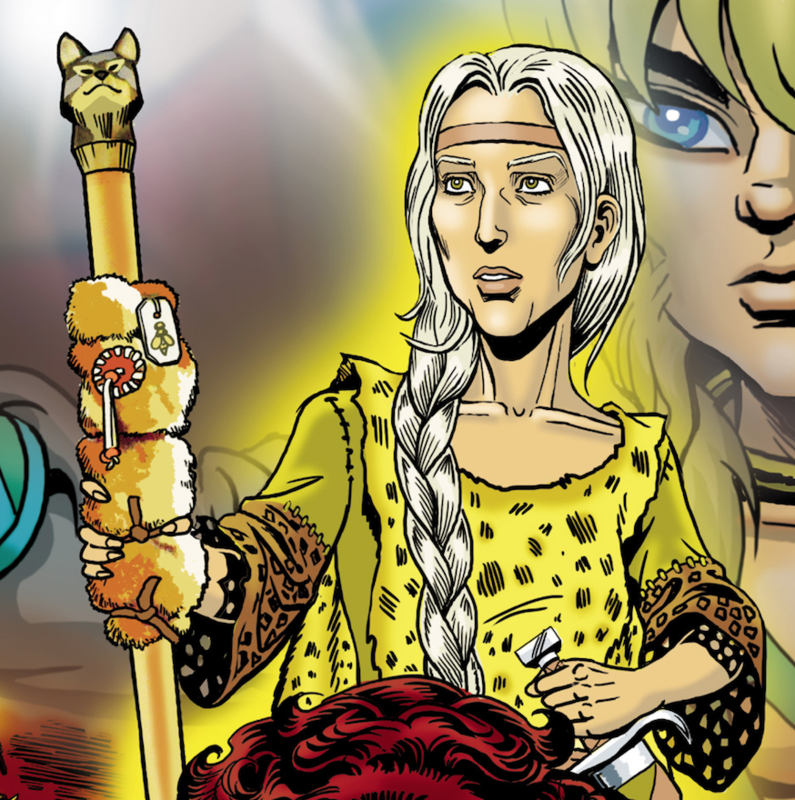 Built of true strength of character, Shuna had a difficult journey early on in life. Finding her courage took time, but she is resilient. Though she stumbled along the way, Shuna always got back up. Raised in an abusive household, her father–a mercenary employed by Grohmul Djun–tried to beat Shuna’s spirit out of her from a young age. With help from the “blessed spirits” she encountered as a youngster, she not only escaped his control but led others in a rebellion that would ultimately topple the tyrant himself. Shuna was just a child when Leetah fell through the roof of her home as she lay mortally ill with “the rot.” After witnessing Leetah heal herself, Shuna’s mother compelled her to do the same for her dying child. This simple act of kindness made Shuna a part of Leetah, and instilled in the young girl a deep belief in the magic and mystery of elves. Years later, she ran away from home after helping Tyleet escape from her father. Living on the streets, she became enraged by the cruelty of the Djun, and finally incited others to rebel. After Shuna’s followers overran the Djun’s citadel, Cutter offered her a home with the Wolfriders. She accepted, and the elves adopted her. Shuna loved living with the elves, despite being confused by their ways and awed by their powers. A close bond developed between her and the shape-changer, Kimo, who became her constant companion and protector. Though she began to recover from the abuse suffered at her father’s hands, Shuna’s first marriage to Nunkah proved to be a a mistake. Recovering her strength, Shuna ended their marriage and found love again with the kind and gentle “Bee.” Together, they raised a son, Shukopek, and traveled to many clans, working to build peace and understanding between the elves and humans. After Bee was killed, Shuna requested to be altered by Leetah to live longer than average humans so she could continue to spread her message of coexistence and harmony. Later, she learned to send—perhaps as a result of the same transformation.